In 1904 B'nai Jeshurun, the "Hungarian synagogue", decided to change to family seating. Many members, intent on keeping the tradition of separate seating for men and women, left and formed Oheb Zedek. They built a synagogue at Scovill Avenue and East 36th Street. As its members moved to Glenville, Oheb Zedek followed. In 1922 they built one of the largest shuls there, at Morison Avenue and Parkwood Drive. Shown at the left, it is now a Baptist church. In 1925 when Rabbi Porath was in Cleveland attending a Mizrachi convention, Oheb Zedek leaders asked him to be their rabbi. He moved his family from New Jersey and would be their rabbi until 1939. In July 1939 he left for N'vai Zedek. Rabbi Louis Engelberg, younger, American-born and American-trained, would take his place. N'vai Tzedek was founded by Lithuanian Jews in 1918. In 1922 it constructed its first building on Union Avenue ar East 119th Street in the Mount Pleasant - Kinsman area. Rabbi Israel Porath came to N'vai Zedek in 1939. It was a smaller congregation in a less prosperous neighborhood. On August 6, 1944, the shul celebrated completion of volume 3 of what the Plain Dealer called his Talmud Digest. His son, Chaplain Tzvi Porath, was a special guest at the dinner. Rabbi Porath left N'vai Zedek in 1945 to become Dean of Salanter Yeshiva in New York City. Mrs. Porath, unwilling to move to New York City, remained in Cleveland with the children. The rabbi would return to Cleveland the next year, to lead a congregation in the "Heights" where so many Jewish families were moving. The building at 14274 Superior Road, south of Mayfield Road, had been a sanitarium before it was bought in 1928. The large brick building in the rear was built in 1947 to add a sanctuary and auditorium. It still stands today. Photo source: Cleveland Memory Project at CSU. 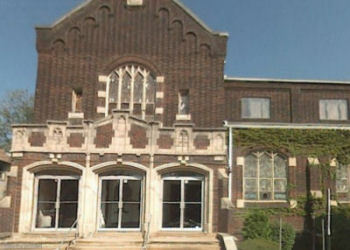 Heights Jewish Center, formed in 1923, was the first congregation in Cleveland's eastern suburbs. (B'nai Jeshurun's "Temple on the Heights", built in 1926, was the first synagogue building in the Heights.) 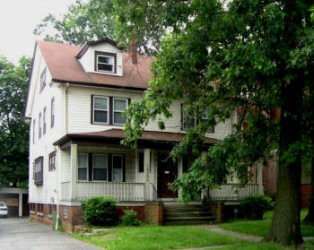 HJC attracted many young families leaving the city and moving "up the hill" to Cleveland Heights for its new housing and good schools. Rabbi Porath arrived in 1946. He was 60 years old, yet he was about to begin a very fruitful part of his career, as a community leader. 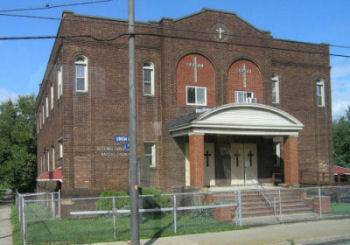 In the 1940's several Orthodox congregations leaving Cleveland merged with the HJC. Rabbi Porath's years at the Heights Jewish Center were the years of his leadership of the Orthodox Rabbinical Council, of his recognition as the "dean" of the Orthodox rabbinate, and his work representing the needs of the Orthodox community to the Jewish Federation. He continued to write; a new edition of his seven volume Introduction to the Talmud would be published in the late 1950's and early 1960's. On July 1, 1972 Rabbi Porath became Rabbi Emeritus, a position he held until his death in April 1974. In 1952 Oheb Zedek merged with Chibas Jerusalem to form the 500-member Taylor Road Synagogue. Led by Rabbi Louis Engelberg, with four more shuls that had been in the city joining, it was for years Greater Cleveland's largest Orthodox congregation. In 1959 N'vai Zedek merged with the Warrensville Center Synagogue which, to honor the memory of Rabbi Jacob Muskin took the name Kehillat Yaakov. In 2011 the congregation built a new home two miles east on Cedar Road, between Green and Richmond Roads, named the Cedar Sinai Synagogue. Now they are known as Oheb Zedek Cedar Sinai Synagogue. website In 1978 the congregation bought a building on Cedar Road in University Heights, about two miles to the east of the Superior Road shul and next to a city park. That building, originally a Masonic Lodge, its interior remodeled, is still its home today. Their name remains Heights Jewish Center. For their website, click here.